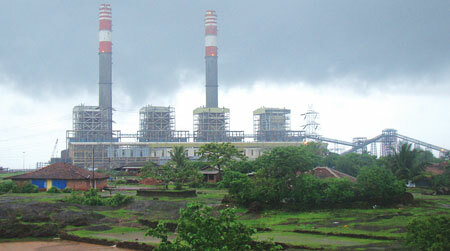 THE Union Ministry of Environment and Forests has bent backward to commission the 1,200 MW thermal plant in Ratnagiri district of Maharashtra, promoted by the Jindal group. The ministry has agreed to let the plant function without the flue gas desulfurization (FGD) unit needed to remove sulphur dioxide (SO2) from the flue gas emitted by burning coal. The company, JSW Energy Limited, has been given three years to install the unit. JSW had approached the ministry on June 21 seeking permission to operate the plant without the FGD unit costing Rs 527 crore. The ministry agreed and ordered the constitution of a supervisory panel to monitor SO2 levels. The panel, headed by P Pujari, horticulture professor at Konkan Krishi Vidyapeeth, will identify mango orchards for installing SO2 monitoring stations. Their data will be uploaded on JSW’s website. The plant in Jaigad tehsil is surrounded by alphonso mango orchards. Farmers and activists have opposed the project from the outset. “At least 900 hectares (ha) near the plant are under mango cultivation. The quality of alphonso mangoes here is very high and they are exported to developed countries that have strict quality certification,” said Vivek Bhide, a mango orchard owner in Malgund near Jaigad. “If the plant is commissioned, we will face difficulties in getting export certification,” he added. The Konkan Krishi Vidyapeeth has been studying the possible impact of the project on alphonso mangoes in the area for the Jindals for a year. Pujari said the report cannot be made public till it is completed. Asked about the commissioning of the plant without the FGD unit, Pujari said the ministry’s permission is conditional. He said the plant’s impact on mango orchards would be known only when monitoring begins. JSW spokesperson Rouhan Sharma refused to comment. Experts said the emissions will affect the orchards. “Mango flowers are very delicate. They can get charred by air laden with SO2. The emissions can also cause acid rain; even acidic dew drops can affect the flowers,” said P R Arun, an environmental consultant in Mumbai. The Delhi High Court had earlier asked the ministry’s expert appraisal committee to re-examine the project’s environmental clearance. The committee while favouring the plant’s commissioning had said the emissions would benefit the mango orchards (see “Coal emissions nourish trees’, Down To Earth, February 28, 2010). “It took us almost 10 years to get an FGD unit installed at the 500 MW Dahanu thermal power station in Thane district despite a Supreme Court order,” said Michelle Chawla of Tamarind Tree, a non-profit in Dahanu. “Even after the unit was installed, there is no study on its effectiveness,” she said. It is very sad to note that even such polluting industries are taking the pollution control measures so lightly, and the responsible authorities are hand in glove with them. A thriving agro ecosystem is being seriously threatened here and there is no effort to safeguard the nature and people's livelihoods, by ensuring even a basic mitigatory measure such as FGD. Are we still waiting to REVOLT? Excellent work by Reshma Jathar & Satyajit Chavan to bring the true story of mango growers & poor farmers of Jaigad region of Ratnagiri in the limelight. The study reports done on the region of Ratnagiri & Sindhudurg in the past by the govt of Maharashtra categorically mention that if small,mini & micro Hydel projects are installed at the foothills of Sahyadri in this region it would produce around 12000 MW of power.The monsoon in this region amounts to 46 % of toatl monsoon in the entire Maharashtra state.But the govt & the politicians are not interested in these hydel projects,they are interested in the TPPs as these are projects by the private companies & there is a lot of hidden financial benefit in issueing the permissions to these projects. In the bargain this highly biodiversed nature,wild life,rare birds,health of the local villagers,tasty alphonso mangoes,cashews,trditional fishing etc everything would face the disastrous effects of the emmissions of these coal fired thermal power projects.In short such a kind of power generation is a kind of brutal violance in itself in the country where Gandhiji lived once upon a time !!! This is not the isolated example. The scene around the most power plants is the same. Often the promoters of the power plants promises that they would take all the necessary precautions to minimized the impacts on the surroundings. However, these false promises are happen to be only mean to diffuse opposition from local people. However, once the plant starts commissioning, even the basic precautions are unheeded. However, the foremost issue and concern is the high concentration of coal based power plants (approx. 19 in number with total capacity around 20,000 MW) that going to come up in ecologically fragile Konkan region. Many of them coming up immediately next-door to the JSW Energy's Jaigad power plant in Ratnagiri district of Maharashtra. Jaigad Plant is the first to commission amongst these proposed plants. The big question is the how the Jaigad plant commissions and precedence it put, will be surely superseded by the power plant to follow. The sheer imagination of devastating impact is sufficient to scare off any sane person. It is perennial problem of our system and the credibility of the government has immensely eroded. More than half of the power plant in the country are not meeting the environmental norms. Even though the green signal for the commissioning of plant is been awarded by, the Ministry named as ''Environment and Forests''. Protection of forests and environment is only the pretension, where as it actually serving the purpose of the promoters of the plants. The above-mentioned record of accomplishment of the power plants in India is sufficiently supports this fact. Therefore, whatever happening in Konkan- coastal region of Maharashtra is one nothing but the govt. sponsored planned devastation of the Konkan. This is really bad that this ruling government is not only killing the people but also the nature. On the one hand they are talking about the "TOURISM" and the other hand they are bringing such polluting projects which is very dangerous for the people's livelihood. If such projetcs come then who the hell will come in kokan or govermnent is planning to show them thermal and nuclear power plant to tourists. This ruling government should be vanished immediately otherwise they will make us "Bhikari". I used to live in Jaigad many years ago. My last visit was in 1996. I was horrified today to see this monstosity on the landscape, and feel for all my old friends there. We all know what is going to happen. There will be no pollution controls due to the system of 'hapta'. The company will ride roughshod over the local people and their livleyhoods will be destroyed. Already many local people have been displaced, and a pittance paid for their land. (this situation was ongoing in the 1980's when the land was purchased for an iron and steel plant) This was a beautiful part of the world with great tourism potential, but after seeing this today, I don't think I will ever return. I know India needs to produce energy, but this is not the way. Dr Jayendra Parulekar puts the case perfectly. The local agriculture and fisheries, which Jaigad has depended on for centuries, are under extreme threat. It brings great sadness to my heart to see what has happened there. Well, fact is most of the politician doesn't care about even nature as well and this is the cause that day by day nature is getting over & due to this we get very costly vegetable, fruits etc. in market like mention in article Alphonso mango.